Whilst I understand their importance in the ecosystem and, on an intellectual level, I think they're quite interesting - I must admit that I really prefer my little world to be bug-free! However, these colourful little critters pose no threat to my peace of mind! Doesn't look like it's really a bug's life! I'm also not very good at two-step stamping - no matter how hard I try it's always a struggle to line up the images. 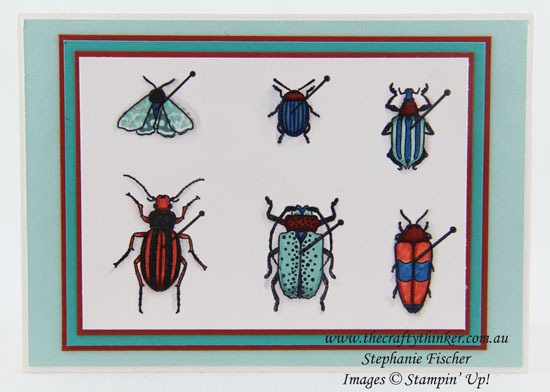 The good news here is that although these bugs are advertised as two-step stamping - they're very effective if you just colour them in! I used Stampin' Write Markers to colour these and only used the two step stamping on half of the images. I think this card will be for one of my little great-nephews!